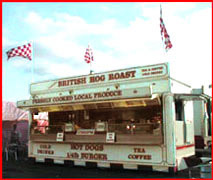 We are a progressive business offering a quality mobile event catering service for many outside venues, including fetes, fairs, pop concerts, agricultural shows, sporting events, outdoor events, and even film crews on location. 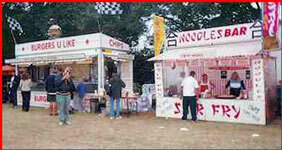 We offer a superb range of 'fast foods' at reasonable prices. 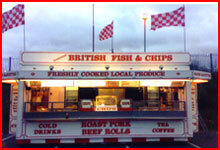 We use only best quality produce, which is cooked or prepared freshly on-site. 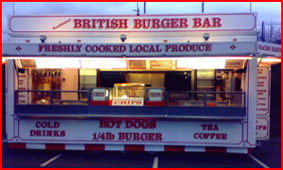 In addition to our popular Burger Grill Bars, our mobile catering units include traditional Fish & Chips; a traditional Carvery serving freshly roasted pork, beef and turkey; a Chinese-Style Stir-Fry Noodle Bar and a Candy Stall. We pride ourselves on cleanliness and presentation. We have all the relevant certificates to satisfy both Corgi and Health & Safety procedures and standards. We also supply necessary seating arrangements, plus canopy covers for customers convenience during sunny or wet weather conditions. We only employ experienced catering staff who have been trained especially to serve the public from our mobile catering units. We can also provide a bouncy 'Super-slide' for the kids, which is constantly supervised by our experienced personnel. If you are interested in our services or require more details, please do not hesitate to phone us on 01342 719760 or 07971 759835 anytime. 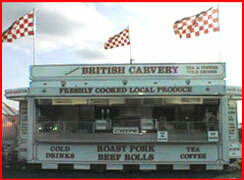 We trust we can help you with all your event catering requirements. WE ONLY BUY THE BEST - WE ONLY SELL THE BEST!